How much should you plan your plot? Fiction writers need to plan their plots. They need to be organized. But should they also allow their characters and the plot to develop on their own? A huge caveat needs to be placed on any answer to this, including my answer here. No two writers are the same. No two stories are the same. The best answer for you might not be the best answer for another author. So take the following paragraphs as good advice that might be helpful, but don’t take it as Gospel truth. I won’t know until I start writing it. So I finally finished Chapter 13 and let a couple friends who had been waiting on it, read it. Immediately after they finished reading, they both had the same question….. “What happens to Troy? !”I count it a good thing that I left enough of a cliffhanger at the end of a chapter that they want more, but is it bad that I can’t answer their question? Hell, even I have nothing but the vaguest idea what happens to Troy. And I won’t until I start writing it.Do others write like that? Or is it just me who lets the voices in my head tell me the story as we go instead of outlining some grand plot? As a basis for starting work on your manuscript, the more organized you are the better. An outline of the chapters and what you want in them is helpful. You can do this yourself, or if you are hiring one of our ghostwriters, you can have her do it for you. The same goes for character development. And choice of location. The more you have a specific vision, the more detail you should create. Otherwise, you will make it up as you go along, or your ghostwriter will. Is making it up as you go along all bad? Actually, to some degree, it is important to maintain flexibility in fiction-writing. To some degree, characters write themselves. The more interesting the character, the more likely he is to write himself. Having a detailed outline is important, especially in a very complex plot, but maintaining flexibility will allow your characters to develop themselves in a way that flows naturally. It is interesting that on the same day that Brandy Moss asked her question, JK Rowling lets out her own misgivings about having followed through on early plans for her characters, rather than allowing them to develop the way they would might naturally have developed. IT WAS the romance every Harry Potter fan wanted to see. Now JK Rowling has admitted she got it wrong by pairing off Hermione Granger with Ron Weasley rather than her franchise’s hero. We are big Harry Potter fans in this house, most of us having read the books multiple times and all of us having seen the films multiple times. And this answers the one question that has always left us scratching our heads. But it also shows that even with the most successful franchise in history, there remain questions of how how much planning and how much flexibility is enough. The answer does not stop with the author, either. CNN reports on how fans weigh in on both sides of the debate. That leaves us with the question of the day: “How much should you plan your plot, and how much should you let it develop on its own?” Please feel free to own experience as a writer/author in the comments below. 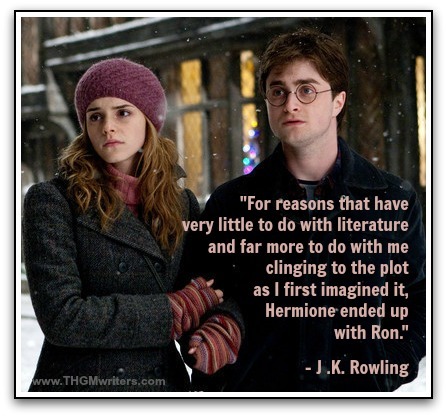 Personally, I usually plan/outline my plot, but then allow myself the freedom to change things as I actually write. I find it’s helpful having a general structure, but I like to give myself some leeway too. It’s really interesting seeing how other authors approach this though.